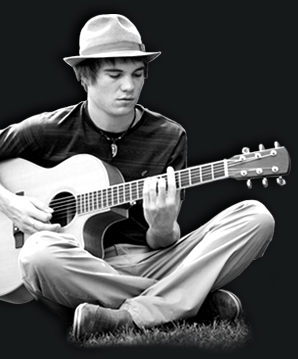 Jord Allen grew up in Bendigo playing his music to friends and family. It has been such a long and hard road as every independent artist would know, but Jord has put every part of his teenage years into writing songs and singing his heart out at every one of his 200 shows. Starting out with his Dads' old guitar the sound of the acoustic guitar grabbed his attention while his peers were into something so much the opposite it made him want to work that little bit extra to put his own style out there. Founder of the Independent Musos Network, Anita Donlon gave Jord a leg up by opening up so many doors to the music industry. But hard work and long nights have really turned Jord into an emerging artist becoming the first fully independent artist from Bendigo breaking into the top 50 of the ARIA charts. "Get Happy" is Jords' first EP, a 4 track little wonder telling tales of fun times, home sickness, picking yourself back up again and finding answers to all those puzzling and difficult questions life throws at you along the way. It starts you humming, tapping your feet and singing along. Jord has spent the last year playing anywhere and everywhere, putting on his hat and playing his songs that he has written along the way. Jord is constantly on the road touring, that’s where he finds his passion, playing live. He's probably played in every pub where there's beer. Playing shows with artists such as Brewster Brothers/Angels, Taxiride, James Reyne, Russell Morris, Brian Cadd and Ross Wilson his genuine attitude and positive outlook is keeping him grounded. Living in Bendigo Jord is starting work on his first album, no reggae this time as he is really keen to get back to his roots and influences such as Bob Dylan and Cat Stevens. He is set to record an album that is genuine and meaningful, making this an album worth waiting for. Please request 'Get Happy' regularly using the links below or simply call. Listen to our tracks, view our video clips and leave your comments!